John Lendrum Mitchell, the only surviving son of millionaire Alexander Mitchell, was widely known through his activities in business, politics and philanthropy. After serving in the Civil War, he developed a profitable 480-acre farm in the Town of Greenfield where he earned a reputation as a breeder and trainer of trotting horses. A leading Democrat, Mitchell served as both a U. S. Congressman and Senator from Wisconsin and on the boards of the State Agricultural Society, the National Soldiers’ Home and the Milwaukee Public Schools. In 1878, Milwaukee architect Edward Townsend Mix designed “Meadowmere,” a three story Queen Anne style home for Mitchell and his family located on the Greenfield farm. Materials were obtained from around the world and experts from Europe installed the embossed ceiling in the formal dining room, the stained glass in windows and doors, and the mother-of-pearl fireplaces inlaid with copper and wood. After the death of Mitchell’s widow, the Carmelite order acquired the home which became, in 1938, St. Joseph ’s Home for the Aged. The 28-room house has been treated with care and respect and the parlor and dining room are unchanged from the time of the Mitchells. Officials of the Edward P. Allis Company of Milwaukee chose a site west of the city for a huge new manufacturing plant in 1900. Construction of this facility served as a catalyst in the development of the suburb of West Allis, assuring other industries of adequate rail service. In 1901, even while the Allis plant was being built, the firm merged with three others to form the Allis-Chalmers Corporation, a giant producer of heavy machinery and engines. In 1905, the Allis-Chalmers Corporation built a clubhouse so that its West Allis employees could participate in social and recreational activities on company premises. Lunches were served for a nominal fee in three separate dining rooms: one for men, one for women and one for department heads. The latest magazines and newspapers were available in the Lounge / Reading Room. The Clubhouse was also the site of evening social activities and lectures on technical or scientific subjects. Several architectural details such as French doors, the building’s cornerstone, arched windows and some of the facade bricks were stored for possible future use before the building was razed. A fireplace, wooden bookcases, and chandeliers from the building’s drawing room as well as other interior pieces were moved to the school’s new location at the West Allis Center. The Milwaukee County Historical Society, according to a newspaper report at the time, was under agreement to compile a historical record of the building as well as salvage significant architectural pieces. Photos were to be taken and videotapes made of both the interiors and exteriors so that a historical record of the building would remain, according to the article. The photos and videos would be made available to local historical groups and would be used as a resource if plans eventually unfolded to bring the program back from West Allis. A scale model of the building was made and given to the County Historical Society. A farmers’ market has been in continuous operation in West Allis since 1919. The original location was at Conrad’s Point, a triangular tract immediately north of the present site. The present location was acquired in September 1926 for $18,500 but its development took a number of years during which the market at Conrad’s Point continued to be used. The present structure was dedicated on May 9, 1931. Its cost was $25,000 and it contained 154 roofed stalls. Some renovations were made under the CETA program in 1978, and additional repairs were made in 1982, 1983 and in the early 21st century. The market is the largest open-air market in the Metropolitan Milwaukee area. Its initial establishment reflects the European practice of shopping daily in such markets that was familiar to many area residents. All produce sold at the market was actually grown by vendors. This 1887 Richardson Romanesque Cream City brick school house, most likely designed by Henry C. Koch, now houses the West Allis Historical Museum. Restoration of the school building, the first high school in the Town of Greenfield, has been restored using proper preservation procedures to maintain its original appearance. Russell Zimmerman designed the wooden bell tower which had been destroyed by fire. It was replaced in 1973. In 1976, a window was restored to replace a doorway cut into the west side to connect with a garage storehouse. The first class of Honey Creek School District opened in December 1843. It was taught by William Wallace Johnson who had built the log cabin one room school. Fire destroyed the school. It was rebuilt as a clapboard building and, in 1850, as a red brick school until the current building was constructed in 1887. 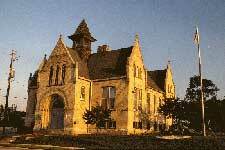 It became part of the Village school system in 1902 and the City of West Allis in 1906. It was used for classes until 1924 when Franklin School was built. Subsequently it was used by the West Allis School Board for storage, as a carpentry repair shop, and for vocational training. During the war it was used as a Civilian Defense office, for Civil Air Patrol meetings and as the first office of the West Allis Memorial Hospital. It became the West Allis Historical Museum in 1968. In 1892, this site became the permanent home of the Wisconsin State Fair after its purchase earlier by the State Agricultural Society. Until then, the Fair had moved annually since the first one in Janesville in 1851. Over the years, State Fair has not only showcased agriculture, but also military, recreational and cultural activities. The Park housed troops and equipment for the Spanish-American War and for World Wars I and II. It featured auto races since 1903, Green Bay Packer games from 1934 to 1951, and world class speed skating at its Olympic-sized rink since 1966. Cultural phenomena demonstrated at past Fairs included cooking with gas (1859), airplane flight (1910), and television (1932). The State Fair Park Board, created in 1971, became an independent state agency in 1990. State Fair Park attracts two million visitors to hundreds of events throughout the year, including the Fair, the state’s oldest event. The Milwaukee County Historical Society’s recognition of the Wisconsin State Fair Park on its present site in West Allis is not limited to a building or any specific structure. The traditions and diversity of events that connect agriculture with industry at the State Fair are just two of the many reasons the fairgrounds have received historical recognition. The first Wisconsin State Fair was held in Janesville in 1851. During the next 41 years, the Fair was also held in Watertown, Fond du Lac, Madison and Milwaukee. It wasn’t until 1892 that the Fair was finally held on today’s permanent site in West Allis, the former Stevens Farm. All the wood-framed buildings built for the new 1892 facility were gone by 1910 and replaced by more durable structures of brick, steel and concrete. Today, only three of those buildings, built between 1908 and 1910 remain. One is the 1909 Dairy Cattle Barn that was renovated in 2000. That restoration, although bringing it up to today’s standards, retained the building’s original style. The other two remaining buildings are the Horticultural Building and the Dairy Building where the Fair’s famous cream puffs have been baked and sold since 1924. A new Exposition Hall opened in 2002, and a new Cattle Barn in 2003. They were designed to blend with and compliment the architecture of the 1909 Dairy Cattle Barn. Some of the Fair’s past historical highlights include the 1859 visit by Abraham Lincoln when he was campaigning for the Presidency. He gave fairgoers his only speech on agriculture. The first airplane to appear in Wisconsin was a Wright Brothers plane piloted by Arch Hoxsey. He landed the plane and took off from the racetrack in front of the grandstand with the Wright Brothers in attendance. In 1898, during the Spanish-American War, the fairgrounds were renamed Camp Harvey and became the Wisconsin National Guard’s largest training center. President Hayes visited the Fair in 1878, President Taft in 1909, General Sherman in 1865 and 1866, and General Grant in 1866 and 1880. In 1919, on the fairgrounds, the Lawson Company built and produced the United States’ first passenger airplane. The Green Bay Packers played part of their schedule in front of the grandstand from 1934 to 1951. It was there that they won the 7th NFL Championship against the New York Giants 27 – 0. Olympic Gold medal winners Dan Jansen, and Bonnie Blair trained and skated to victories at the fairground’s Pettit National Ice Center. Since 1903, national race drivers, including Barney Oldfield, Rex Mays, A. J. Foyt, Alan Kulwicki, the Unsers and Andrettis, have competed on the legendary Milwaukee Mile Oval, the oldest automobile racing facility in the world. The Wadhams Station in West Allis, located at South 76th Street and West National Avenue, was built in 1927. Harger W. Dodge, a son-in-law of Edward A. Wadhams, inherited the Wadhams Oil and Grease Company of Milwaukee in 1916. Responding to the merchandising problems of the new petroleum industry, Dodge set out to make his retail gasoline stations both utilitarian and aesthetically appealing. He hired Milwaukee’s most prominent society architect, Alexander C. Eschweiler, to design a prototype gasoline station. Eschweiler may have chosen the oriental design for two reasons: the first was that the Japanese model had been established in the Midwest as a viable model for architecture at the Philadelphia, Chicago and St. Louis World Fairs of 1876, 1893 and 1904 respectively. The second possibility was that he was influenced by Frank Lloyd Wright’s work in designing the Imperial Hotel in Tokyo, Japan. The station in West Allis was designed and built by Hugo C. Hauser of Milwaukee . The Wadhams “oriental” station was incredibly successful, resulting in the building of over one hundred such structures between 1917 and 1930 throughout the Upper Midwest. Its unique characteristics included white painted brick walls, wood framed roof covered with stamped metal tile painted red, and stained glass windows on the north and south elevations. The stained glass windows are yellow displaying a large red “W” to advertise the company. The tile was manufactured by Bauer and Ward Sheet Metal Company; the brick came from Rickertson and Schwartz Brick Company. Frank Seneca leased the station from Wadhams in 1938 until he retired in 1978. Restored in 1999-2000 by the City of West Allis Department of Development, the interior currently displays many artifacts from Wadhams and Mobil. The only remaining Carnegie Library building in Milwaukee County, the West Allis Carnegie Library was constructed in 1913 with the aid of a $15,000 grant from philanthropist Andrew Carnegie. The West Allis library was one of over 1,600 public libraries throughout the United States funded by the steel magnate. Designed by architect Edwin O. Kuenzli, the library served the West Allis community until 1989 when a new facility was opened. At that time, the City of West Allis and West Allis Historical Society considered converting the Carnegie Library building into a cultural center for the community. However, those plans did not come to fruition, and the building was eventually converted into apartments. The property was designated for its cultural and architectural significance.